The World Magnetic Model (WMM) is a standard model of the core and large-scale crustal magnetic field. It is used extensively for navigation and in attitude and heading referencing systems by the UK Ministry of Defence, the US Department of Defense, the North Atlantic Treaty Organization and the International Hydrographic Organization. It is also used widely in civilian navigation and heading systems. Irregular changes in the Earth’s core field limit the lifetime of any predictive model such as the WMM. For this reason a revision (WMM2015) was released in December 2014, valid until 2020. In September 2018 version 2 of WMM2015 (WMM2015v2 valid 2015.0-2020.0) was released after feedback from users to the announcement in March 2018 that WMM2015 had become inaccurate in the Arctic region and was not meeting its accuracy requirements. These models were produced by BGS jointly with the US National Centres for Environmental Data (NCEI), with funding from the Defence Geographic Centre in the UK and the US National Geospatial-Intelligence Agency. WMM2015 consists of a degree 12 spherical harmonic model of the Earth’s main field (MF) at 2015.0 produced by NCEI and a mean rate of change estimate (called secular variation, SV) over the period 2015.0 to 2020.0 produced by BGS. WMM2015v2 constituent MF and SV models were averages of NCEI and BGS models. In order to construct the SV model for WMM2015 we used data with as much coverage in space and time as possible. 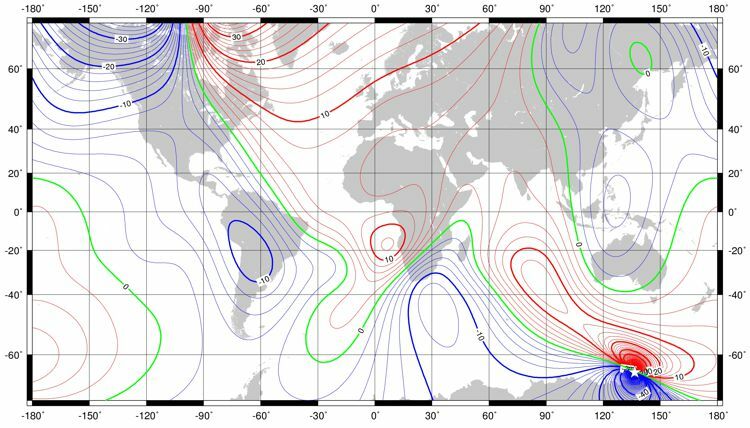 We took data from the European Space Agency Swarm magnetic survey satellites (launched in November 2013) up to the end of October 2014 to construct a sixth-order spline model of time variation of the magnetic field. Prior to the launch of Swarm we used data from around 160 land-based observatories which have continuous temporal coverage. The WMM is a model of the core and large-scale crustal fields only. However the satellite data contain unwanted signals such as small-scale crustal, external ionospheric and magnetospheric and their induced counterparts. These fields would have added noise to the WMM2015 SV model and could have biased its estimates. BGS employed two techniques to avoid the contamination caused by external magnetic fields. Firstly we rejected those data most contaminated by these sources, as identified by a combination of local time, geomagnetic indices and solar wind data. However, this had an unwanted side effect in leaving temporal gaps in the data. This would have had a strong effect on the quality of the SV estimates. We lessened this effect by including similarly selected data from the magnetic observatories. Our second technique was to initially model the larger unwanted sources that we could not easily reject. We therefore constructed what we called a ‘parent model’ for the WMM, including these extra sources, before removing the unwanted components to finalise the WMM. The WMM parent model also included harmonic terms for large-scale magnetospheric field variations and their induced components.